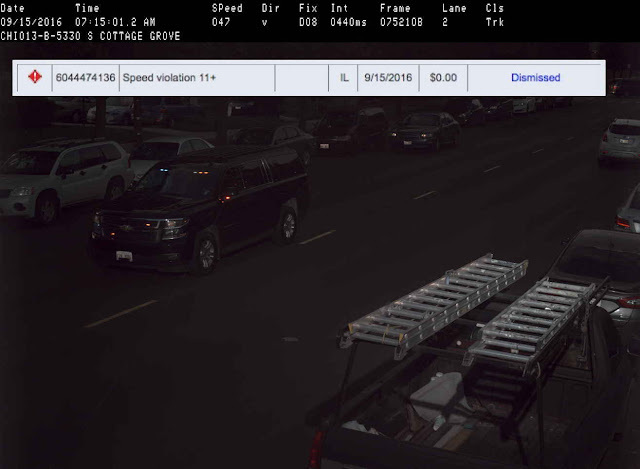 Cook County Board President Toni Preckwinkle says she does not condone speeding. She says any speeding tickets issued to her county car “are paid.” We found the truth to be a little different. The emergency lights on Preckwinkle’s car are flashing. In the video, you can even see an on-coming driver pull over to make room. The driver was probably wondering what terrible emergency the oncoming SUV with flashing lights was heading to. It was nothin'. The lights were on to get the peasants out of the way. Preckwinkle has yet to pay the $100 ticket, according to a City of Chicago website. Back in October 2016, CWBChicago tweeted a speedcam pic of Preckwinkle’s county car barreling down South Cottage Grove at 47 MPH in a 30 zone. Emergency lights a-blazing. One small problem, Toni. You didn’t pay that ticket. You had it dismissed, according to the city’s website. That's right. 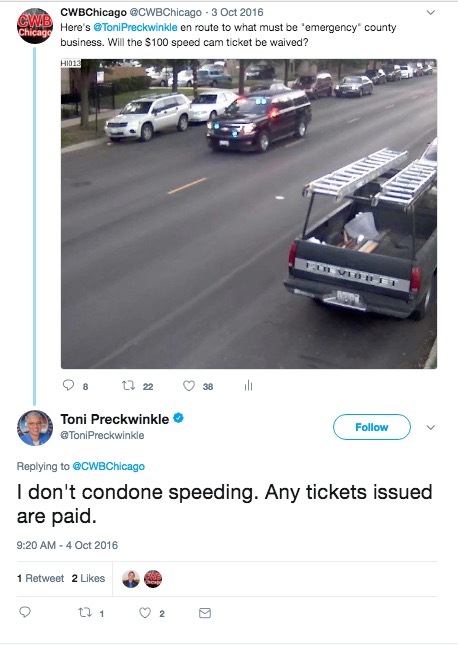 City of Chicago records show that Preckwinkle didn't "pay" the ticket she said she would. She fought it and had it thrown out. Here's the proof, Toni. Below is a speedcam pix of your car rocketing along on September 15, 2016. It's the same incident that we tweeted about back then. We've inset information about that ticket from the city's website. "Dismissed." Nice. That's pretty bold. Saying "any tickets issued are paid" and then turning around and having that exact same ticket dismissed. Almost as bold as speeding around the city with your emergency lights on for no apparent reason. • One ticket was a warning.